Julia writes about the day she was told her son had cancer and her determination to raise awareness of childhood cancer. 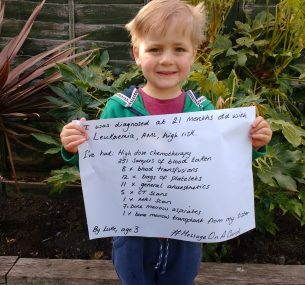 Luke was diagnosed with leukaemia at just 21 months old in September 2015. It’s because of those words that in May 2017, my lovely friend Helen and I will be taking part in a duathlon. We will both be doing a 10km run, 40km cycle, 5km run, to raise money for Children with Cancer UK. “At 2:30am on Thursday 10th September 2015, I felt my heart physically break as I was woken and told that my then 21 month old son had cancer. Leukaemia, AML, M7 – high risk. After a four week battle seeing 12 different doctors at the GP’s, local Urgent Care Centre, A & E and the eye hospital, we finally had an answer. Luke hadn’t scratched his eye, or been stung by an insect. He hadn’t been bitten, he didn’t have a dermoid cyst, and the cyst didn’t rupture. He had an aggressive form of cancer – a mass of blast cells attached to his cheek bone, with a further mass later discovered on one of his ribs. He had cancer, my baby, and our lives were changed forever. GP surgeries, hospitals, TV, magazines – the walls and pages are filled with information on cancer. Breast cancer, prostate cancer, skin cancer, lung cancer, cancer this, cancer that, but nothing, absolutely nothing to do with childhood cancer. It seems to be a real taboo subject, and I don’t understand why. I appreciate people may find it upsetting to hear about, or to look at a photo of a child fighting cancer, but personally, I find it more upsetting talking to a parent who has been told there are no further options for their child. Without awareness there is no funding, without funding there are no cures. 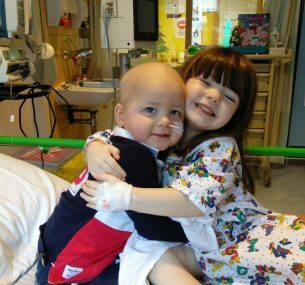 Ten children are diagnosed with cancer in the UK every day. TEN! Every single day. That’s almost 4000 children a year – just in the UK. Are these 4000 children not worth talking about? Do they not deserve to live? Without awareness people don’t recognise the symptoms, without awareness doctors don’t recognise the symptoms. Early detection can save lives. Children with Cancer UK raise awareness and carry out much needed vital research into fighting the monster that is childhood cancer. Yes, survival rates have improved hugely in recent years, but the treatments need to be kinder, the lifelong health effects for survivors have to improve, and innocent children must stop dying before their lives have even started. Nobody knows what causes childhood cancer, nobody can tell you when it’s going to happen. There are no links to lifestyle or environments, you cannot cause it, you cannot prevent it, you have absolutely no control over it. It is very different from adult cancers. You may think your child is immune, but they are not, nobody is. It just invites itself into your life and rips it apart. Race, religion, wealth, it does not discriminate and it does not care. Shockingly, 1 in 500 children in the UK will be diagnosed with cancer by their 14th birthday. My eyes have been opened wide to this un-talked about world and I can’t, and won’t, just forget it. Everybody should know what these brave children go through and everything should be done to make it stop. Taking part in this event will be a huge, huge, physical challenge for me, but I am determined to raise as much money as I can for this charity. Admittedly, it may take me all day to complete, but I will do it. I’ll run for all the days my son couldn’t walk. I’ll cycle for the 135 days he lay in a hospital bed – unable to leave his room due to infection risk. For the 251 samples of blood he’s had taken from his little body, the 98 long hours he was pumped with toxic chemotherapy, the 22 NG tubes he had passed up his nose down the back of his throat and into his stomach so he could be fed, his Hickman line that was surgically placed in his jugular vein and hung out of his chest for a whole year, the 8 blood transfusions, the 12 bags of platelets, the 11 general anaesthetics, the 10 chest x-rays, the 5 CT scans, the MRI scan, the 9 ultrasounds, the 7 ECG’s, the 3 lumbar punctures, the 7 bone marrow aspirates, the trephine biopsy, his bone marrow transplant from his magical life-saving then 4 year old sister. His second birthday and Christmas spent in isolation separated from family and friends, his bald little head, his screams, the fear in his eyes, and for all the finger pricks, heel pricks, NPA’s, drugs, BP’s, temperature’s, infections and tears that there have been so many it’s impossible to count. I’ll do it for him, for his future, for all the beautiful children we met who are now shining bright in the sky, for the 10 children who stepped onto the oncology rollercoaster today, and for the 3 of those 10 who will sadly die. I’ll do it because no child should have to go through the heart breaking hell that I have seen, I’ll do it because no parent should lose a child. And with every step I will be thankful that my beautiful, brave, brave, boy is here, that he is in complete remission and is winning his fight against this monster. I will be thankful for all the people who ran and cycled and did crazy challenges before me, who raised funds for much needed research into this dreadful, dreadful disease. Research that allowed my daughter, our incredible teams at Great Ormond Street, North Mid and the outstanding NHS, saved my baby. Not that long ago our story would have had a very different ending. Research changed this, research kept our family together and research needs to continue.